Pokémon Go has taken over the world. In the moments I’m not exploring the city trying to catch ‘em all, I’ve found myself idly wondering about Pokémon Theory. What moves are super effective against which types again? What is a critical hit? And how did those multipliers actually work anyway? First order of business, I needed to figure out how attack multipliers actually work. Thanks to Bulbapedia, I learned that it is a matchup of the attacking move’s type, and the type of the defending pokémon, and with the help of the PokeAPI, I was certain I could create a tool allowing a matchup between any two pokémon and any move the attacking pokémon had learned. The resulting table should give one row for every combination of move and pokémon. The PokeAPI returned 620 moves, and I grabbed the original 151 Pokémon, so to check my work I verified that the returned row count of the query was 151 x 620 = 93,260. There are a lot of matchup charts available, but I wanted to start adding in the subtleties of damage calculation. The first expansion was to calculate the damage multiplier when the defending pokémon has two types. We need to look up the relevant multipliers for each of the defending pokémon’s types and multiply them together. We now have a solid pokédex to perform our analysis. And there we have it! 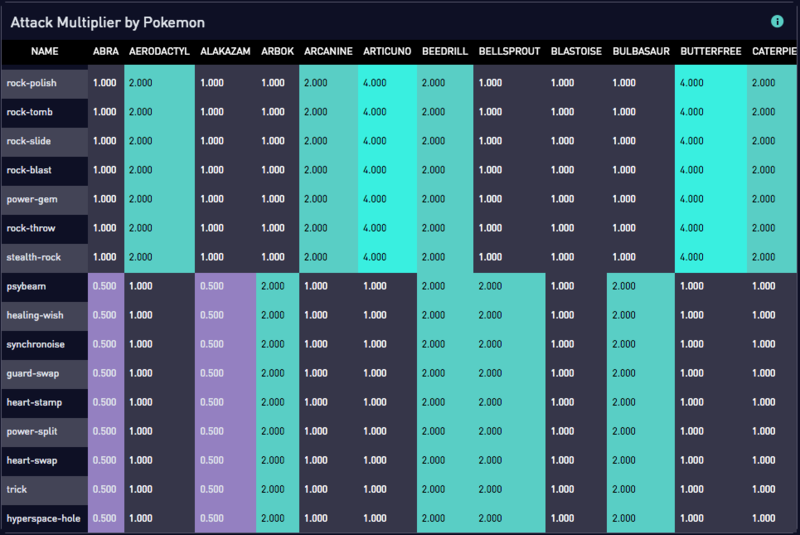 Checkout the interactive dashboard for analyzing Pokémon Battle Matchups.